As a young country, the UAE needs a sense of continuity in its iconography. The barasti, barjeels and sand dunes all provide a link with a kind of past; but between those traditions and the glitzy bustle of today comes the group of buildings of the 1970s and 80s that represent a first stab at nationhood. There’s an obvious danger in valuing anything and everything that’s merely old(ish). Some of the enthusiasm for modernism seems to be less about merit and more a kneejerk desire to preserve something – anything – that proves the UAE is capable of creative city-making. But it’s true that the cities of the UAE are something of an urban laboratory, testing new possibilities and experimenting with new ideas that will inform the immediate future of high-density high-energy high-value human settlements. So it’s worth respecting some of the early examples of that thinking. Which is why we applaud the latest move from the Architectural Heritage Department of Dubai Municipality. It is already preserving more than 200 of the Emirate’s oldest buildings, especially around Al Fahidi and Al Shindagha. Now the Planning Department and the Architectural Heritage Department have launched a joint programme called Modern Heritage to protect some of the Emirate’s most recognisable buildings from the 1960s and 1970s, selected for “their cultural, social, architectural and tourism impact”. A short list of buildings has been produced as a first stage. Ahmed Mahmoud, director of the Department, said “many of these buildings still occupy major positions and perform important functions … [They] have had a great impact on shaping the urban environment and the architectural character of Dubai’s development”. Note that the emphasis is on ‘impact’ rather than ‘merit’; this exercise sounds sociological rather than architectural, and it’s none the worse for that. Top of the list for several reasons is the Dubai World Trade Centre, built in 1973. Yes, it was the first skyscraper in the region; and it might possibly justify Ahmed Mahmoud’s description of “a landmark that reflects the harmony of local architecture with modernity”. Equally important, though, it was a statement about Dubai’s ambitions, a marker for the future of trade and business. At 149m high, the 39-storey office tower was for some time the tallest building in the Arabic world (it was superseded by the Burj Al Arab 20 years later). It was designed by the studio of John Harris, a British architect who became a trusted advisor to Sheikh Rashid. The Al Maktoum family recognised the power of symbols, and in the John Harris designed for them a symbol for the scale of Dubai’s ambitions on the international stage. That’s why it features on the AED 100 banknote. The results still looks good – top-quality modernism, utilising new materials and advanced technology, emphasising function, simplicity, and rationality over ornamentation and whimsicality, using clean lines and simple geometric shapes. Other buildings from the studio of John Harris also figure on the list, among them Deira’s Al Baraha Hospital. Built in 1966, it one of the first sizable purpose-built hospitals in Dubai. Sheikh Rashid actually had Harris work up two masterplans for Dubai – one in 1960 and a second in 1971. Harris’s future-gazing attempts to respect the original layout of Dubai while adding zoned areas for development, but he was on a hiding to nothing: the city was just growing too quickly. As Yasser Elsheshtawy writes, “Dubai has laid out numerous master plans since 1960, all of which have gone unnoticed because they failed to anticipate the rapid growth of the city”. The list from Ahmed Mahmoud’s team also includes the likes of the Al Ras Library, the oldest in the UAE (it was built in 1963). Architecturally indifferent it may be, but it social value and its role as a statement are undeniable. The same applies to the Al Khuloud Nursery School in Karama, a design that was replicated many times across the Emirates. And almost inevitably there’s the Deira Clocktower. 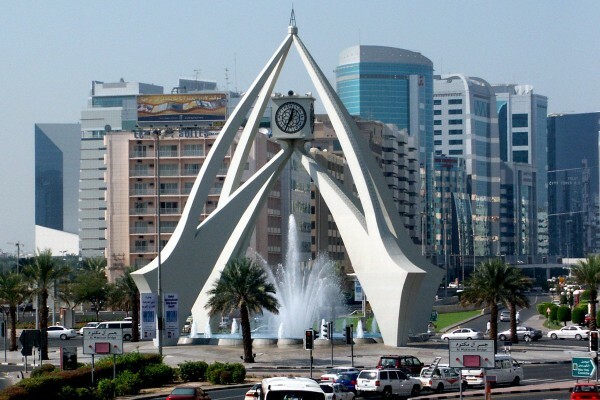 Designed by architect Ziki Homsi, then a partner at Architecture Design Construction, it was built in 1965 on the roundabout that provides access to the first bridge over the Creek, Al Maktoum Bridge; this is a landmark in many ways. Not for nothing is it regularly listed as among the top ten clock towers of the world. It’s a heritage well worth looking after.